I've just completed the first round of edits on EXCALIBUR - and managed to cut a hair under 43,000 words from it. That's more than a quarter of the whole thing - or looked at another, more annoying way, practically two weeks' writing. Oh well, it had to be done, and it's undeniably better as a result. So now, come the New Year, my next task is to add in all the bits and pieces that I realised were missing the first time round. Little things like, y'know, exposition. Trivial stuff! 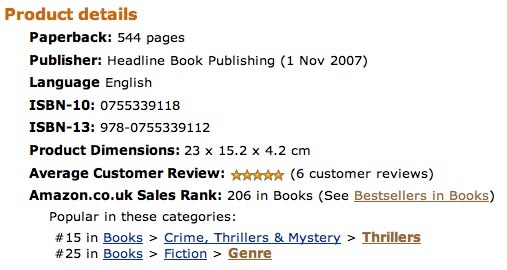 Reaching #15 in the thrillers chart was definitely a strange moment. Looking down the list, it was made up of the likes of Ian Rankin, Patricia Cornwell, James Patterson, Martina Cole and, er, me. Weird... but gratifying! 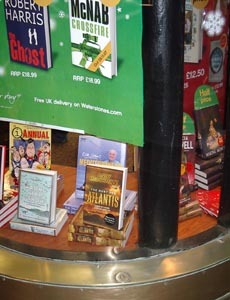 That's right; THE HUNT FOR ATLANTIS made the top 1000 books on Amazon.co.uk! Considering that we're in the run-up to Christmas and the charts are clogged with your Nigellas, your Doctor Who Annuals, your Hamsters and your Russell frickin' Brands (the mere title of whose book fills me with such an incandescent rage I refuse even to name it), that's pretty damn good going for a first-time author! Got a very nice write-up in the Bournemouth Daily Echo today, practically a full page. I wonder if that's enough to qualify me as a "local celebrity"? And if so, do I get the key to the town, or at least free coffee and sandwiches? Read the full article here. 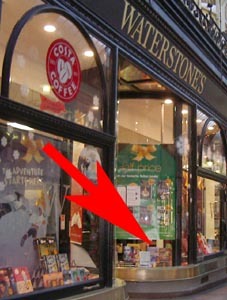 The book signing in Cambridge went very well - over 40 hardbacks signed! I had no idea there'd be that much interest, but was certainly glad of it. I don't think my signature went too wonky by the time I reached the last few. I also shot a promo for the Meet The Author website, which will also be going out to places like Amazon, iTunes and even Tesco. It only took five takes, which considering I had to speak to the camera for over a minute without forgetting my lines wasn't too bad. Of course, when I actually watch the piece all I can do is wonder "Who is this pasty, potato-faced, balding mumbler?" but I doubt even Industrial Light & Magic could make me look good on screen... Joking aside, you can hear me describe THE HUNT FOR ATLANTIS in my own words by watching the clip here. I took my first crack at editing THE POWER OF EXCALIBUR down to a reasonable length by looking for action sequences I could cut without affecting the story. I'm not sure if it's good or bad that I found two - it's good in that it helps me lose 15,000 words, but it's bad because if they're not necessary to the story, they shouldn't have been there in the first damn place! Still, by deleting them and all the exposition relating to them it brings the word count down to around the 152,000 mark, slightly less than the first draft of THE TOMB OF HERCULES, so I know I can keep cutting from there. 51 straight days of work. About three thousand cups of coffee. One bout of illness. And a smidgen under 168,000 words. Yeah, that last one's the problem. The book came out far longer than I'd planned - essentially, I'm going to have to cut one word out of every four that I've written. But I knew I was going to have to chop it down anyway; typing 'THE END' is only the beginning of the actual work, switching from the right-brain creative aspect to the left-brain critical one. And having glanced at some of the pages as I printed them out, there's going to be a lot of self-criticism. I might need to buy a couple of new red pens. But it's done. And as a little capper, Headline told me today that THE HUNT FOR ATLANTIS has been sold in Thailand, adding yet another country to the growing list (in addition to New Zealand, where I just learned it's gone on sale). So I'm feeling very upbeat, and on Thursday will be at Heffers bookshop in Cambridge at 12:30pm for a signing before taking a much-deserved weekend off! Wow, out of nowhere I got my first newspaper review! Today's Mirror featured THE HUNT FOR ATLANTIS in its book section; it wasn't exactly an in-depth critique (there's not much that can be done in 44 words), but I still got the awesome quote "Adventure stories don't get much more epic than this" out of it, which is now plastered over the site's front page. And I've been told that it'll also be covered by the Observer in the next couple of weeks. Considering that I was expecting to get exactly no press reviews, I'm pretty damn thrilled! Being struck down by a stomach bug is not good at the best of times, but particularly not when you're a writer getting close to the epic ending of your novel. Creative thoughts tend to get overridden by one more prosaic: "How quickly can I get to the bathroom?" Still, I managed to peck out some material nevertheless, though the timing could have been better - couldn't it have waited a week? Although I'm still ahead of my daily word count target, things have seemed to go more slowly this past week, which I'm putting down to the fatigue of 37 straight days of work. Why not take a break, you may ask? Because I know from past experience that if I stop, even for a day, it takes at least another day for me to get back into my groove. Since I'm also on a deadline, I don't want any interruptions! That said, THE POWER OF EXCALIBUR is at last moving towards its endgame. Just a quick helicopter chase over Moscow to go, and the story will move on to its antepenultimate location! If I can keep up my current pace, the first draft should be completed in less than two weeks. Slightly longer than I'd hoped, but the story will take as long as it takes to tell - and then I can start chopping it down to size! If I stay healthy, that is. After a horrible night's sleep, I woke up this morning with the feeling that my aching, pulsating brain was trying to crack open the top of my skull from within, like an egg in a microwave. If it turns out to be flu, I'll be very annoyed about the timing! THE HUNT FOR ATLANTIS is now out! At least in some places - it hasn't shown up in Bournemouth yet, though I've been assured it will over the course of the next week. It's another difference from magazine publishing, where if a mag is so much as a day late going on sale it's a sign of trouble, whereas books have a much longer shelf-life. Still takes a bit of getting used to, though - and dammit, I want to be able to go into a bookshop in my own town and see my book there! 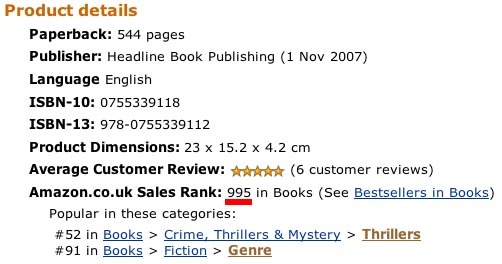 One annoying side-effect of the book now being on sale is that I've turned into a compulsive checker of its sales ranking on Amazon.co.uk, something which can only lead to madness. It's down to 25,000, now 27,000 - whoa, it's back up to 7,000! Woohoo, somebody's bought a copy! No, wait, falling again to 10,000, 14,000, still dropping, into the thirties, fifties, oh God nobody likes my book, THE BEES! THEY'RE IN MY EYES! AAAUUAARGLE! Yeah, that's probably something I should try to stop doing. EXCALIBUR rolls on, passing the 95,000 word mark today - it should reach 100,000 during Tuesday. It's getting the point where I'm starting to feel a certain amount of grind, as I've now been working on it for six to eight hours a day, seven days a week, for four weeks... and there's still a fair amount to go. I was hoping to be at about the two-thirds mark by now, but it looks as though it's going to wind up being longer - which is a drag, as it just means I'll have to cut out more later to meet the word count. But I'd much rather have an overlong yet completed story which I can then attack with a red pen than one where each chapter is polished but the whole thing is only half-finished - the sheer sense of achievement on actually completing the first draft and typing 'THE END' is hard to beat! I also saw Headline's cover for THE TOMB OF HERCULES, which looks awesome - really strong and impactful. I'll add it to the site once it's been finalised, which should be soon as it's now entering the final stages of production. This means I'm currently in the slightly odd situation of working on three books simultaneously - writing THE POWER OF EXCALIBUR, proofreading THE TOMB OF HERCULES (the copy-edited version of which arrived this morning in a very heavy package) and planning THE COVENANT OF GENESIS, as well as fretting over the imminent publication of THE HUNT FOR ATLANTIS! It's all go - but it's also all good. Every so often, I have to just sit back and remind myself, "Wow, this is what I do for a living. How cool is that?" I didn't quite manage another 25,000 words in the second week, but I wasn't far short and still exceeded my 3000 words-a-day target, so everything is proceeding apace! I had a bout of sluggishness early in the week because I had to deliver a wodge of exposition - not my favourite part of the job, and it's at the top of the list of 'things to cut down drastically' when I start the revisions. But once that was out of the way, the pace picked up as I got back to the stuff I really enjoy writing - the action! Syria was the setting this time, with camels, quad-bikes and a MiG-31 fighter jet all playing a part. Next stop: Austria! There's still plenty of room for creativity in what might seem like a self-limiting process, though. Almost all the dialogue is made up on the fly, the characters reacting to events at the same time I do, and I often have no idea what people are going to say to each other until I actually type the words. And sometimes, even the characters' actions take me by surprise, if the situation and setting lend themselves to unexpected improvisation! So, 25,000 words in, and on to the next 25,000. And the next, and the next... By the way, if you were wondering about the title of this update, it's because I set an early action sequence right here in my home town of Bournemouth. Bournemouth has been distinctly under-represented in literature; in James Herbert's The Fog, the entire population committed suicide by hurling themselves into the sea, and a giant robot from space took a holiday there (demolishing half the town centre in the process) in one of Douglas Adams' Hitch-Hiker's Guide novels, but as far as I know, that's it. Since the only initial requirement for the sequence was that it take place in an English town, I thought, "Oh, well, why not?" (Though you should have seen the deeply dubious look my editor gave me when I told her my plan...) But there's an assassination, a cleaver-lobbing fight in a hotel kitchen, a car chase through the town's crowded pedestrian precincts and the explosive destruction of what was voted Britain's second-ugliest building, so I think it'll deliver all the necessary action! So, this morning I began work on THE POWER OF EXCALIBUR, and I decided to make this page into a mini-blog of sorts to track my progress. Which today wasn't bad at all; I always aim to write at least 3000 words a day, and I managed to beat that and write the whole of the prologue. The contracts are signed, the publication dates set - now all I have to do is write 'em! Books 3 and 4 are now go with THE POWER OF EXCALIBUR due out in November 2008, and THE COVENANT OF GENESIS to follow just six months later in May 2009. Yes, I'm now doing two books a year, so that ought to keep me busy! The timing of the new contract worked out rather well, as today also happens to be my birthday. As presents go, I think that's rather a good one! So I'll be having a relaxing weekend, before starting work on THE POWER OF EXCALIBUR (a working title, by the way) on Monday morning. I'm looking forward to it! I got some fantastic news today - Headline has just given me a second deal, for another two books! I'm tremendously excited about this; more details to follow soon! Anyway, I'm extremely happy with the way THE TOMB OF HERCULES turned out - it reveals completely new sides to the heroes of THE HUNT FOR ATLANTIS, as well as introducing several fun new characters who were highly enjoyable to write, good guys and bad guys alike. As for the action, there's a sequence beginning at a diamond mine in Botswana which (in my slightly biased opinion, admittedly) is more than a match for anything seen in the movies in terms of sheer scale and pace... and things only get wilder from there! So with THE TOMB OF HERCULES out of the way, it's time to turn to my next project. I have several ideas in development, and can't wait to get started! After procrastinating about it for far too long, I finally took the plunge and set up my own website for the purposes of promoting my books (and okay, I admit it, myself as well) - so here it is! Obviously at this early stage there's not all that much content here, but hopefully that will change soon.